Office buildings in Browary Warszawskie shoot up. The Gatehouse Offices building was delivered in December and the construction of the Villa Offices building can be seen from Grzybowska street. Echo Investment also executes the construction work on the foundations of the largest office building in Browary Warszawskie – the Malthouse Offices. A good pace of construction is accompanied by the leasing process. Offices in Browary Warszawskie account for 50% of the area of this new-old quarter on the map of Warsaw. The total area available to tenants is more than 50,000 sqm. In December 2018, Echo Investment delivered the Gatehouse Offices building where L'Oreal, WeWork and EPAM Systems Poland have their offices. “We have successfully rented and sold the first office building. At the beginning of the year we announced the expansion of WeWork in the next office building – the Villa Offices. A great deal of companies believe in the potential of the place represented by Browary Warszawskie. They are attracted by the centre of Warsaw within arm’s reach, an extensive gastronomic offer inscribed in the decades-long history of the Time Cellars and town squares that can serve as a place of work for those seeking inspiration. A distinctive feature of the project is the interesting and unique space on the Polish market, which combines modernity and beautiful history of the location, reflected in the historical parts of the project. A great deal of Polish and global brands are interested in locating their businesses in Warsaw's Wola district, and Browary Warszawskie is a significant location on the office map of the district,” says Michał Żelski, a regional sales manager in Echo Investment’s office department. “We are executing advanced work on the next stage of the project, which consists of two buildings – the Villa Offices and the Malthouse Offices, located in the immediate vicinity of the historic Malthouse and the 170-year-old Time Cellars. The first building is at the stage of the 6th floor of a reinforced concrete structure. We have started the installation work and we will start installing the facade within a few weeks. The construction is proceeding according to schedule. We have already completed diaphragm walls at the Malthouse Offices. We are working on the excavation. Where possible, we have already made almost half of the bottom slab and the first few vertical elements. We will reach the ground level of the building in two months. The office part of Browary Warszawskie will be completed at the end of June and early July 2020,” says Michał Gerwat, the director of the Browary Warszawskie project. The Villa Offices were the first office puzzle which started the development of an office destination around the heart of Browary Warszawskie in the renovated Schiele Villa. Its continuation will be the third and largest office building in the quarter of Grzybowska, Krochmalna, Wronia and Chłodna streets, which will provide tenants with almost 25,000 sqm. It is characterised by a non-standard shape which will surround the historic Time Cellars and the Central Garden from three sides. Like the other buildings, it will have a stepped architecture, which will rise to the level of the eighth floor in the main part. 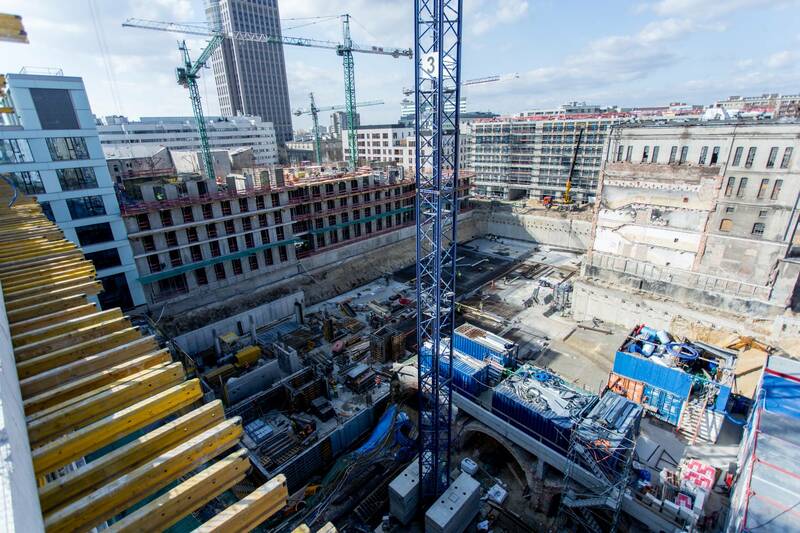 On two levels of the underground car park there will be almost 300 parking spaces for office workers as well as guests of the Cellars and service outlets in other parts of Browary Warszawskie. “The architecture of Malthouse Offices is a unique combination of various functions and ways of arranging the urban space. From here you can go straight to the Time Cellars and use the privacy of the Central Garden. One of the crossings will connect the Malthouse Square with the Lower Square. A glazed façade with elements of cladding in light golden colour and slightly turned, vertical elements of the facade will provide the building with depth, additional variability and chiaroscuro. On a sunny day you will be able to admire the shadows reflecting in this structure,” says Agnieszka Chmolewska, the head of the team of architects in Echo Investment’s office department.